Here is the route covered by this blog posting. 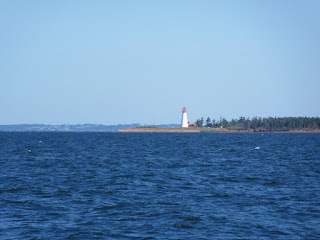 We chose to a picture perfect day for our crossing the Northumberland Strait from Charlottetown PEI to an anchorage at Merigomish Harbour in Nova Scotia. This will be our 5th province on our summer adventure. The sky was brilliantly clear and we had a 10 knot breeze from the west north west. However, we were headed south south east, so the 3’ waves (occasional 4’ waves) were on our stern corner making for a corkscrew sort of ride that got a little uncomfortable. Today, we have three of our four boats (Tug’n, Sir Tugley Blue and Encore), three Nordic Tugs. Wings stayed behind for a few days in Charlottetown so Bob could go home for a short visit with one of his daughters who was gravely ill with MS. They will catch up with us in Cape Breton. Our 48 mile crossing took us about 6 1/2 hours and thankfully for the last few hours the waves calmed down providing a much more comfortable ride. We made our way all the way back in Merigomish Harbour to a lovely, well protected anchorage called Blackhall Gut. 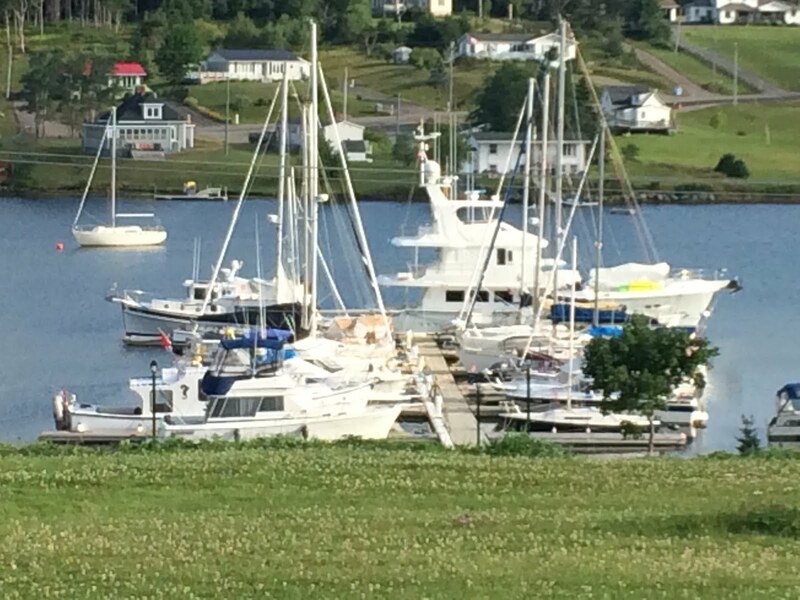 Almost as soon as we all had our anchor down and engine shut off, there began a parade of local boats into the bay to inspect our boats and wish us a hearty “Welcome to Nova Scotia. Where have you come from? Where are you headed? How long are you out for? Etc Etc”. It was as if word spread all around the local community and everyone came out to see us. It was really quite a special welcome. 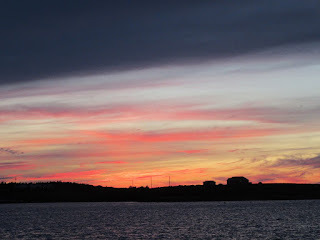 We had happy hour aboard Encore to plan our next day and then Fran & I enjoyed an exquisite dinner of grilled scallops followed by quiet evening with a spectacular sunset. Mother Nature has been very kind to us and we are really appreciating the fantastic weather. An early morning mist cleared quickly as the warm summer sun rose. When we got underway a lovely ebb tide helped to push us along. The cruise through calm water this morning was quite uplifting with sightings of minke whales and porpoises. Today’s cruise was broken into two sections. 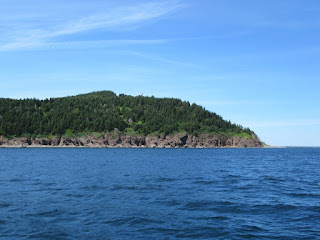 The first was to take us out around the tip of Cape George and into the tiny village of Ballantynes Cove in Antigonish County, Nova Scotia. 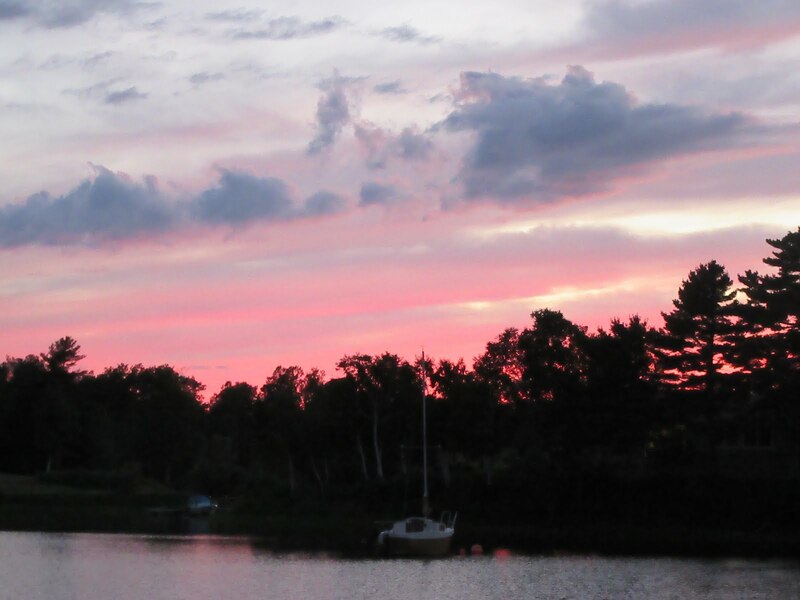 The community and cove are named after David Ballantyne, a lowland Scotsman and British soldier who served in the 82nd regiment during the American Revolution and who received a land grant for his military service. He settled in the area in 1810. 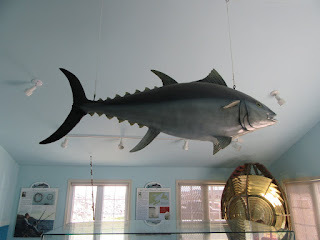 Tuna range in size from about 300 pounds up to almost 1500 pounds. The largest on record is 1496 pounds caught in Nova Scotia in 1979. The season starts on August 5th each year and runs to November. Most fishermen wait until the early fall as to start trying to catch their one tuna as the tuna are in these waters to feed and they gain about 2 kilos per day. 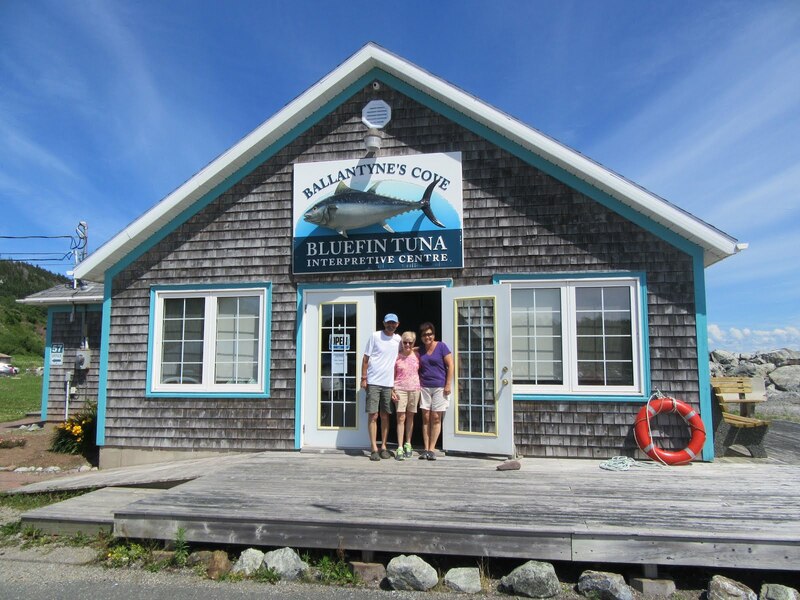 The young lady who guided us through the Tuna Interpretative Centre is a member of a fishing family, who is training to take over her father’s lobster licence in about 5 years. An hour and a half later, we were underway again, headed for an anchorage at Havre Boucher, close to Strait of Canso. 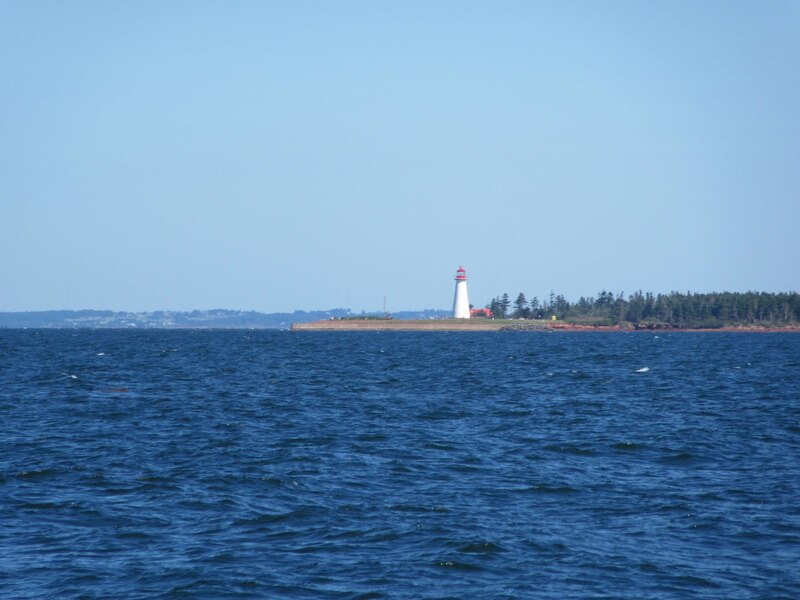 True to predictions in our cruising guide, our crossing of St. Georges Bay was much windier than expected as the ocean wind is funnelled down between the Cape George Peninsula and Cape Breton Island. The waves kept growing until they were 4’ plus from the stern corner making for a very uncomfortable ride. It was a relief to get into the anchorage at Havre Boucher so we could relax. 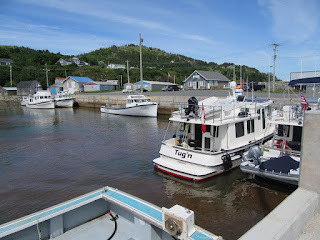 Havre Boucher is a small village that relies on fishing as well as providing services to the surrounding rural communities. 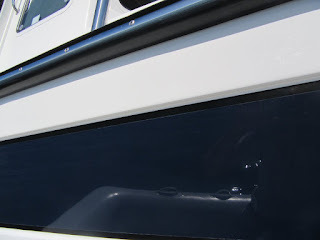 For us, it provided protection from waves and an easy access for entrance to the Strait of Canso tomorrow. 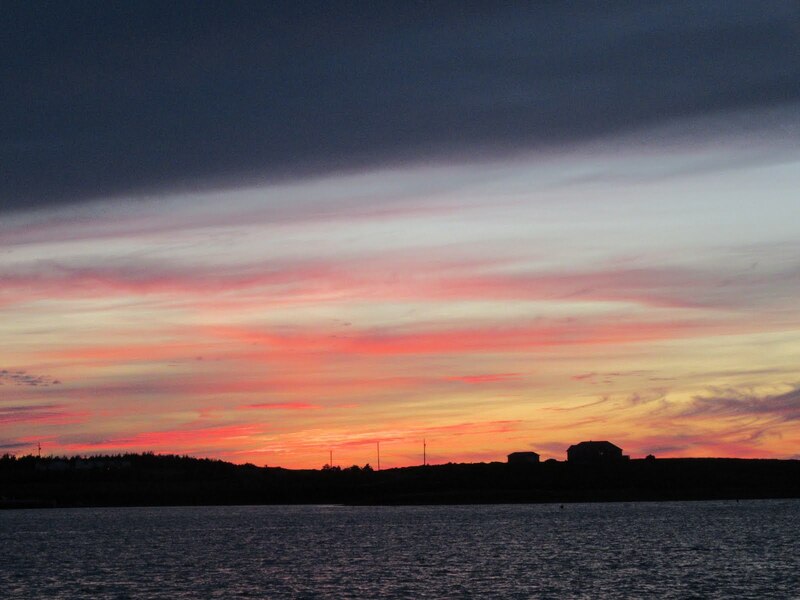 Once again we were treated to another great sunset. The Strait of Canso is the narrow strip of water that divides Cape Breton from Nova Scotia. Canso Causeway is a rock-fill causeway that crosses the Strait of Canso. It is 40 meters wide and 1,385 meters long and it carries a two lane road of the Trans Canada Highway and a single rail line to Cape Breton. The base of the causeway is 244 meters wide and it reaches a maximum depth of 65 meters. Cape Breton remains a true island as the causeway has a 250 meter by 24 meter lock / canal and a swing bridge for vehicles and trains. Construction started in September 1952 and was completed December 10, 1955. Tidal waters produced very strong currents through the strait making it difficult for commercial vessels to transit it. Construction of the causeway completely stopped the tide through the straight making it possible for ships to pass through the straight via a control lock. 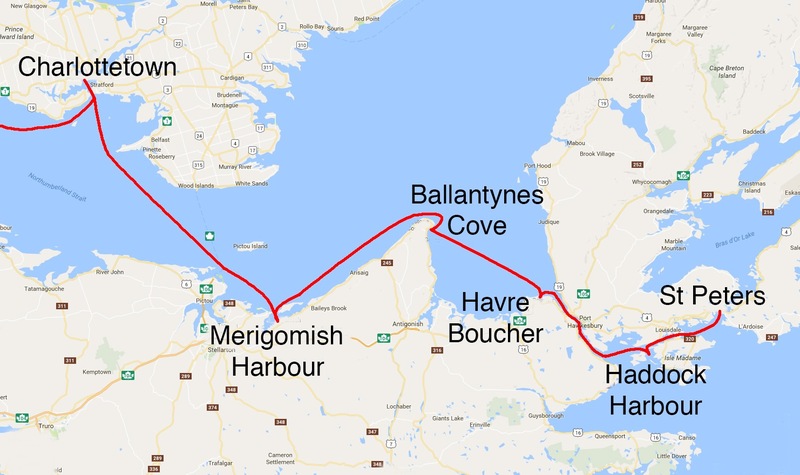 However, the causeway caused some significant environmental damage due to the enormous change in the tidal regime of the southern Gulf of St. Lawrence all the way to the mouth of the St. Lawrence River. The causeway effectively dammed the waterway for migrating ground fish stocks and it took decades until some of these species were able to determine how to get around Cape Breton Island and into the Gulf. The causeway also allowed several non-native animals to gain access onto Cape Breton. For instance, bobcats migrated onto the island, slowly forcing the more gentle lynx out of its traditional hunting grounds. The causeway also dramatically affected lobster fishery with much smaller catches recorded ever since its construction. Our transit through the Canso lock was very smooth and soon we were motoring along through the 27 kilometre long Canso Straight and from there on to Lennox Passage. Our cruising guide directed us into Haddock Harbour where we selected the best anchorage based on the wind forecast. 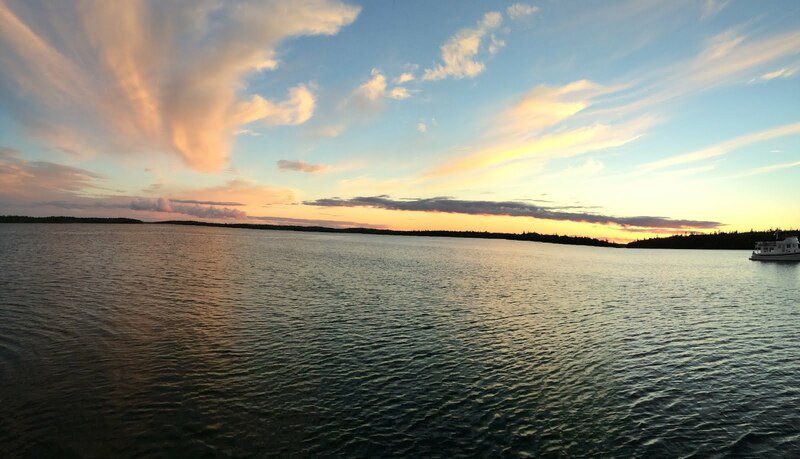 On the positive side, there are far fewer bugs (mosquitos, deer flies, horse flies etc) in a salt water environment. Also, the boat floats higher and goes faster and somewhat more efficiently in salt water vs fresh water. Salt water has tides and currents, so if you plan your trips carefully, you can move faster and use less fuel which is also great. We’ve learned to love tides, sort of. 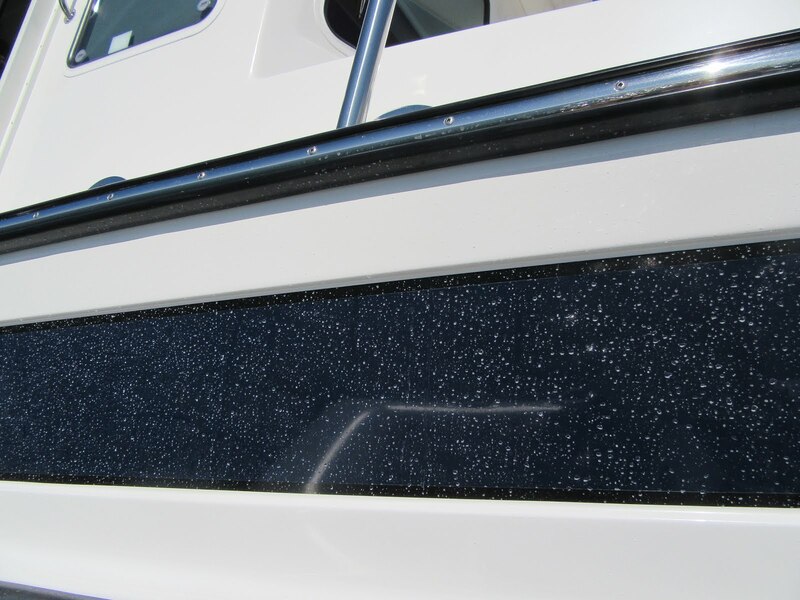 So, with all this new knowledge, the largest impact on our lives is the ritual of boat cleaning. After most daily travel, when at a dock or an anchorage, we dig out the hose and rinse the boat off and wipe it down. Just rinsing alone does not clean the salt off and the boat will still be a mess. We’ve learned you can do a much better job with a pail of hot water and a brush to do the initial light scrub, followed by a fresh water rinse with the hose, followed by a wipe with shammies and/or micro fibre cloths. It is a lot of work, but we are bound and determined to keep the boat looking good and keep the rust away. So far, so good. Later, we and the crew of Encore did a dinghy excursion to explore the anchorage before happy hour aboard Sir Tugley Blue. This was followed by another peaceful evening at anchor. We love to anchor! This morning, Encore and Sir Tugley headed off for St Peters on Cape Breton. We stayed behind thinking we’d wait for Bob and Jan on Wings. I spent the morning giving the hull a good wash to eliminate layers of salt crystals. It was the hot water & brush, rinse with the hose and the wipe down. As you'll see from the “before and after” photos, it is very rewarding work. Later we had a phone call with Wings and decided we’d also head for St Peters and meet them there. While our anchorage was calm and I had hopes the boat would stay relatively salt free today, I was woefully optimistic. As we approached St Peters Bay, the wind picked up to 18 knots and we were taking regular spray over the bow, guaranteeing Tug’n another wash later in the day. Grrrrrrrrr. Entering St. Peters was interesting. 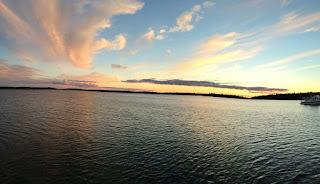 There is a man made, small shipping canal and lock that joins the Atlantic Ocean and St Peters Bay to the Bras d’Or Lakes in the interior of Cape Bretton Island. There is also a northern entrance to the Bras d’Or Lakes that opens to the Laurentian Channel and the Atlantic. Unlike most other channels whose water flow is in one direction, water in the St Peters channel flows both directions. Water on both sides of the St Peters Canal are tidal and timing differences mean one side or the other can be the “high side”. As a result, both ends of the lock have double gates allowing either end of the lock to be the high water side. It is the only lock of its kind in North America. Prior to construction of St Peters Canal and lock, a “haulover road” was established to portage smaller vessels from St Peters Bay into the Bras d’Or Lakes and back.The canal and lock were completed in 1869. Various additions and renovations were completed up until 1917 when the canal became too small for modern ships and since then it has primarily been used by pleasure boats. It was a great experience to transit this historic lock. A short distance after the lock, we arrived at St Peters Lions Club Marina. We’ve never stayed at a marina owned by a service club and it sure turned out to be a great treat. The marina has been run by a manager named Gerry, who has run it since the Lions Club of St Peters acquired it 26 years go. It is just about the friendliest marina you could wish to visit. A day later, Bob and Jan on Wings caught up with us. On Thursday Aug 4th, we celebrated Dave’s birthday (Sir Tugley Blue). Conveniently, the Lions Club had a fund raiser and were selling chowder dinners complete with a bowl of chowder, a roll & butter and a strawberry shortcake dessert. The Lions Club hall was full, so we had a “take away” dinner and all 8 of us sat around a table in the Marina club house and dined on the best seafood chowder we’ve had all summer. Who knew that a Lions Club would serve up the best chowder, but really, it was the very best. It was absolutely loaded with all sorts of seafood including a very generous amount of lobster. Everyone raved about it. I’ll go out on a limb here and say we are not likely to find a better chowder anywhere. Friday August 5th was spent organizing rental cars for the 8 of us, planning two days of excursions on the island and grocery shopping. We also had a surprise visit by boating friends Tim and Bice whom we normally see in Lake Huron’s North Channel. They were on a road trip to the east coast and we had a lovely, but short visit with them aboard Tug’n.